The wise Dr. Seuss asks "Did you ever fly a kite in bed? Did you ever walk with ten cats on your head? Did you ever milk this kind of cow?" He then goes on to say, "If you never did, you should. These things are fun and fun is good." I totally agree - fun is good. I have yet to fly a kite in bed, walk with ten cats on my head, or milk any cow (though, i remain skeptical that walking with ten cats on your head could be considered fun, as I'm pretty sure the result would be a flurry of biting and scratching). But we did have pasta for breakfast. And that was fun. Therefore it was good! I worry that it appears that we have a kale obsession. This is not the case. I promise! I just happened to have a ridiculous amount of the stuff around and wanted to use it up. So I made this. To make the pesto, place garlic, walnuts, lemon zest, and kale in the bowl of a food processor. Pulse. Slowly pour in the olive oil and lemon juice while the food processor is still running. Adjust salt and pepper to taste, then refrigerate. Place cooked and heated pasta in each serving bowl. Fry up bacon slices on a griddle over medium heat. Once both sides have crisped, remove from griddle and place on a paper towel. Chop. In a skillet (I used my trusty cast iron skillet) over medium heat, fry the egg yolk. It will only take about 30 seconds to a minute. You want it to be warm, but still runny. For each bowl, toss the pasta with the pesto. Then top with fried egg yolk, chopped bacon, chopped parsley, and grated Parmesan. One cat on shoulder might be fun...10 on head? I bet after that you would need to see a doctor. 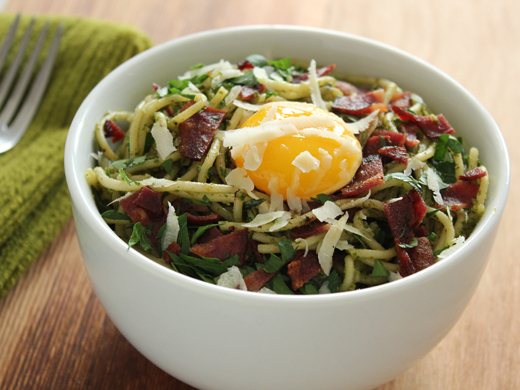 Pasta with kale pesto sounds and looks amazing for the breakfast. So creative!! Looks absolutely tastyyy! What a great idea - this look delicious - especially with the kale! One can never have too much kale, especially when it's served like this! Scrumptious!! Oooh, breakfast pasta? Sounds and looks tasty. Mind. Blown. ;) Dinner for breakfast and a sort of deconstructed carbonara at that! I love it and that you brought Dr. Seuss for dinner, he and Shel Silverstein rule. I just posted on another friend's blog that I needed to get on the kale bandwagon, and here you have a beautiful recipe! I'd mix in scrambled eggs...and I'd be swooning! Talk about a healthy breakfast! I love this. It's such a colorful way to start the day! I would love that breakfast!!! What a delicious idea!Love the egg on top. Kale pasta sounds wonderful!! I've never started a day with pasta. I always love big breakfast and this sounds like my kind of breakfast! A brilliant use for kale, I must try this. I have a kale obsession so I can't judge! Looks delicious. I am trying to eat more kale, so bring on the recipes! This looks delicious. And unique. And a perfect way to start the day. Thank you for sharing! This looks pretty perfect any time of the day! Great combination of flavors and ingredients! If I may, I’d like to invite you to submit your photos to the new YumGoggle, a photo sharing site with the philosophy that if you worked hard to cook it and photograph it, we should show it off! Hope to see you there soon! I've never had breakfast pasta before but that picture makes it look so good! I want to eat some right now..
Breakfast pasta? LOVE IT. I am a kale pesto fanatic. Whenever I have too much I just make it into pesto. Great post. Breakfast pasta?! That's a brilliant idea and so beautifully presented. Well...I DO have a kale obsession...so I'm loving all this kale over here! Pasta for breakfast sounds like my kinda meal. I totally agree: fun is good! and this pesto looks so good too, really loved it! Nothing wrong with a kale obsession (ha ha). Looks good! Brilliant! Love the idea of kale pesto, and then having it for breakfast takes it over the top -- need to try this! I love kale, so keep it coming. And, pasta for breakfast, especially with an egg on top, sounds like a whole lot of fun! I'm a breakfast pasta fanatic and the kale pesto is genius. It must give such a great flavor and you can never go wrong with a fried egg on top of anything. Well, I haven't done any of these either, but pasta for breakfast sounds like a good start! It looks divine! As a big fan of savory breakfasts (and kale! ), I think this is a brilliant recipe! It would also be a perfect contribution to this month's pasta-themed Shine Supper Club!